Margaret Blank: Thoughts from a Textile Artist: 1,000 Posts! 10 Years! It's a few minutes after 8 a.m. here in Central Alberta (that would be Mountain Standard Time), and it's time to start the celebration! Now...where was I? Oh yes...The first Goodie Give-away! "Floss" is the category, and here's how it's going to work. 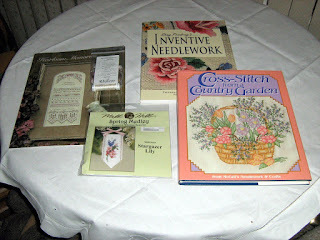 A pristine hardcover copy of Cross-Stitch from a Country Garden from McCall's Needlework and Crafts, Sedgewood Press, 1988 -- which I believe is now an out-of-print treasure. Lest you think, "Hmmmph! I'm not interested in that traditional stitching stuff! "...remember, you might be able to pass on one of the items to someone who is...or you might want to use the beautiful threads, beads etc. in some other creative project. It's my anniversary gift to one lucky Gentle Reader...postage included! And then again...there may be additional mini-surprises with the 'floss' theme through the week. Stay tuned, and have a great Friday! P.S. - I usually read you in my reader so I haven't seen your blog makeover. It's loverly! Wow, what a milestone. Congratulations. Have fun celebrating. We are shovelling. Congrats! So nice of you to share. I do a bit of stitchery so I would love to win. Thanks! The last time I posted on your blog, I won 'Inspirations' magazine. It was waiting for me when I got back from Chicago on Saturday. So thank-you! This is also a lovely give-away and congratulations on 1000 posts. congratulations!! 10 years is quite an achievement!! I haven't tried any needle work...but you never know !! :) Thanks for sharing your celebration with us. What fun! So happy to be following you, Margaret. Wow Margaret ...1000 posts. Congratulations! I like new the look of your site, by the way. Congratulations on your big day. 10 years, wow and 1000 posts.